When I was a kid, if we were lucky, on Saturday we'd have a chippy tea. We'd go to the local chip shop and get to pick out whatever we wanted: in my case, it was always a saveloy and chips, with a pickled onion or gherkin. Saveloys were like some a sausage imagined by aliens with impulse control problems: salty as the sea, and covered in a bright red plasticy sock. I don't want to imagine what they were made of, but I loved them. I still frequented chippys as a veggie and as a vegan, but it was always just to pick up some chips (and a pickled onion. There's always a pickled onion) and that was it. So, when I heard that London chippy chain Sutton and Sons was going to open a vegan chip shop, I knew that I had to haul myself down there for a slap up tea. Mr Flicking the Vs had been there a couple of weeks ago, and came back with glorious tales of vegan battered sausages and such like. After building up a hunger at the Union Chapel's Daylight Music, we travelled up to Hackney in search of vegan fried delights. It very nearly was not to be. The vegan branch of Sutton and Sons was closed on the Saturday we visited. The horror, the horror! Happily, the omni branch a few doors down was still open and has pretty much the same vegan menu available alongside the non-vegan items. After conducting a fierce internal debate with myself over whether the vegan scampi or vegan fish was the catch of the day for me, I decided that it would be a missed opportunity to not try the fish as I'd never tried banana blossom fish before. I think I first saw banana blossom a while ago on Shaheen's blog and was intrigued by what it might taste like. Banana blossom is used as a fish substitute for its flaky texture, and Sutton and Sons marinate it in seaweed (so the menu says) for a bit more of a fishy flavour. Having tried banana blossom fish, I'm not convinced it will ever displace tofish as my fish substitute of choice. The texture weirded me out a little, to be honest, but I'm pretty sure Sutton and Sons could batter anything and I would eat it happily. It truly is excellent batter - crisp and not greasy. Mr Flicking the Vs' battered sausage was way better than the ones I remember from our local chippy (I think it may have pioneered the battered beefburger, a phenomenon that happily didn't catch on anywhere else). Of course, you can only get the true measure of a chippy by its chips, and Sutton and Sons' were totally on point. Not only where they great, there was a generous portion that sent me happily into a carb coma. And there was vegan tartare sauce. Let me repeat that with a few more shouty capitals VEGAN TARTARE SAUCE! That's a chippy that knows how to look after its vegans. (And if you need dessert, which is not a certainty after the sheer volume of chips, there's ice cream from the amazing Black Milq). 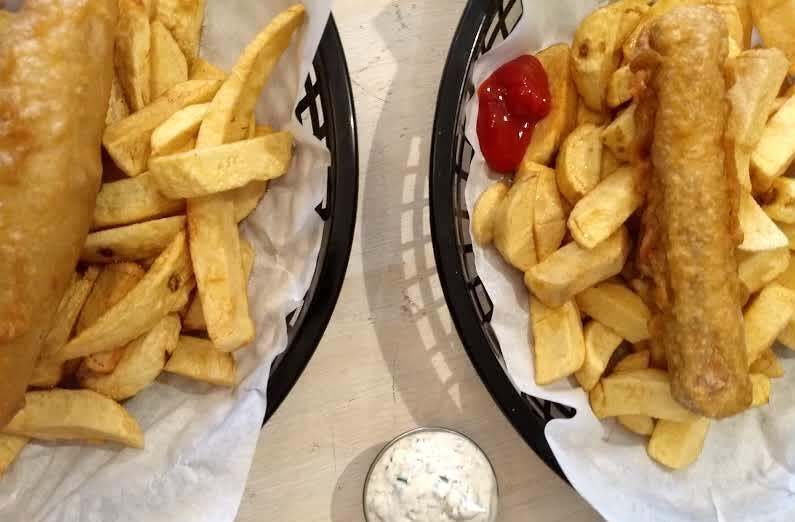 Visiting a chip shop was definitely a childhood, but Sutton and Sons' excellent vegan options has made me love the chippy all over again. 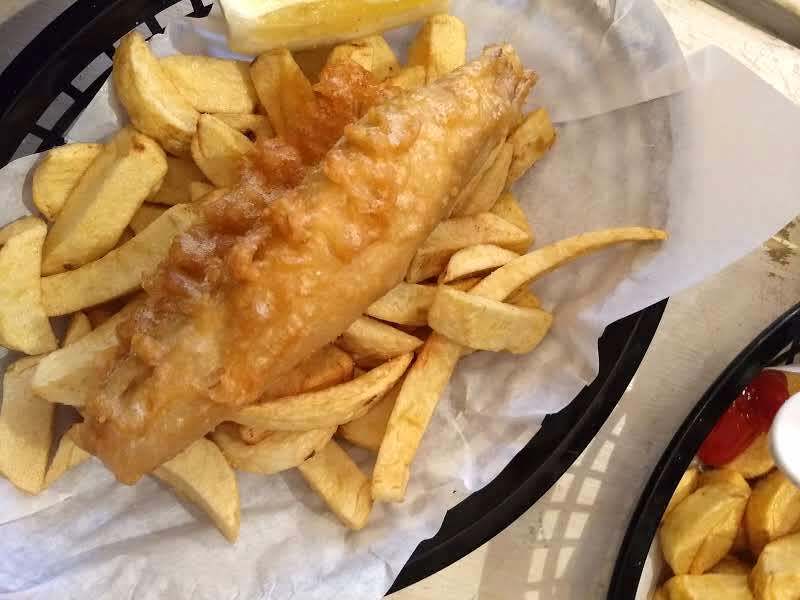 I'd love to have a fish and chip shop where I could relive the glory days of my childhood - fish and chips got us through Lent. I have heard of a few locally that do veg option other than chips, potato cakes and corn jacks (our other loves). 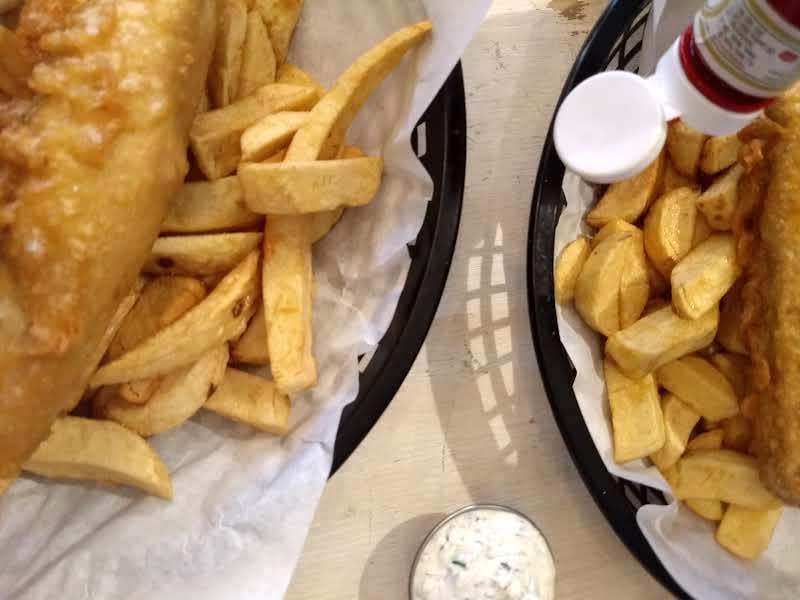 But sadly we don't get out to a fish and chip shop often so I will just have to find my joy in looking at your photos of the amazing batter and chips - I really want to dive in. I'd love to try the banana blossom (even if tofu is better); I'm so curious about it! I grew up with the occasional fish and chips supper on Fridays (hello, childhood Catholicism) and I miss that greasy mess! I am definitely going to try this when I visit my mates in Hackney! Thanks for the review. Thanks for the review! I've heard mixed things about the banana blossom which is part of why I haven't gone myself -- so it's great to know the battered sausage is so good!